Surrounded by the Sierras of São Francisco, Louro, São Luís and Arrábida. Set in the Alcube Valley, with 6ha of area, 3 of which vineyars in total communion with nature, with a swimming pool and a garden, of singular beauty, that extends by the hill. In the heart of Arrábida Natural Park, you can enjoy the best of this area here. The decor of the house is simple, elegant and very cozy. The kitchen and bathrooms are modern and refined. And we´re only 30 minutes from Lisbon, by car! A large porch gives us access to the main door, where we enter on large hall. To the right, the main room, with 50m2. Two sliding doors, between walls, give us access to the dining room where 12 people can comfortably sit. These two rooms lead to a balcony, facing west and with a fantastic view of the Arrábida Mountains. Enjoying this immense space, on sunny days, at relaxed lunches and dinners, on summer evenings, provides unforgettable memories! Returning to the hallway, we have a social bathroom and the kitchen. At the end, the huge master suite ...To the right, the room. A front door gives access to a south-facing balcony. Start the day here with a wonderful breakfast or end the day here reading a fantastic book, are unforgettable moments. Privacy is total! Back to the entrance of the suite, we have in front, a bathroom, with a fantastic shower (90cmX200cm). A bench with two sinks. Full of light! On the left, a room-office. A bookcase on the wall. And a large closet. A wall cupboard is still part of this suite. Again in the corridor, the stairs that go down, give us access to another room. Ideal for younger guests and for faster access to the pool area. It has two windows opening onto a covered balcony, ideal for the hot summer days. In the living room, to the right, a door opens to a suite, with a double bed. To the left, a small hallway gives us access to two bedrooms and a bathroom. On this floor, all the divisions have shutters with direct access to the garden. Returning to the main floor, the stairs that ascend, take us to the attic. A small room, two bedrooms, one of them, very large and a bathroom. Outside, our guests can access the entire property and enjoy its unique beauty. The pool area, with a great sun exposure, provides unique moments of tranquility. The location of the house is unique! The region is famous for high quality wines (Moscatel), the most delicious cheese, the fantastic sweets and the unique tiles, painted by hand. On the other side of the road, we have the famous Quinta de Alcube, known for its fantastic wines. At 1km we have the small village "Vendas" where we can still find the typical Portuguese grocery stores. To the left, we walk another 1km and we are in Vila Fresca de Azeitão known for the fantastic Church of S. Simão, séc. XVII, the wonderful Quinta da Bacalhôa and also the famous hand painted tiles (here we can paint our own tile ...). "Pingo Doce" supermarket is also here. 2km further on Vila Nogueira de Azeitão where we can find "Intermarché", "Lidl", the pharmacy and two restaurants famous for the fantastic gastronomy. The São Lourenço Church and the wine cellars José Maria da Fonseca and Bacalhôa, where you can make tests, are a must visit. Here, we've got a Paddle Court. 11km Portinho da Arrábida: a small port facing south, flanked by fantastic beaches with transparent, crystal clear water and very calm. Considered one of the best beaches in Europe is ideal for children. Some restaurants allow us to enjoy the wonderful fresh fish caught here. The Franciscan Convent built in the 19th century. The 16th and the Forte must also be visited. At 18km we have Sesimbra, a fishing village with a charming castle. At 24km Capo Espichel, the second most western cable in Europe. The view is fabulous. Dinosaur footprints are also still visible ... The stretch of sand on the beaches is indescribable. The quality of the restaurants is another attraction. Returning to Casal de Alcube, we are 7 km from Setúbal: the Municipal Market, considered one of the ten best in the world, is the ideal place to buy fresh fish and vegetables. The historical part of the city is also interesting. From the Fort, the view of the bay of Setúbal, also considered one of the most beautiful in the world, is exceptional. The offer of water sports is enormous: we can see the dolphins, fish, galleons, go to a beach chosen by us or even to the sand banks. We can take a ferry and in 15 minutes we are in the Peninsula of Troia: the beaches are unforgettable. For the practice of sports, Casal de Alcube is also ideally located: to practice Golf, we are 7 km from Quinta do Perú, 7 km from the ferry that takes us to the Golf Course of Tróia (the ferry trip takes 15 minutes ! 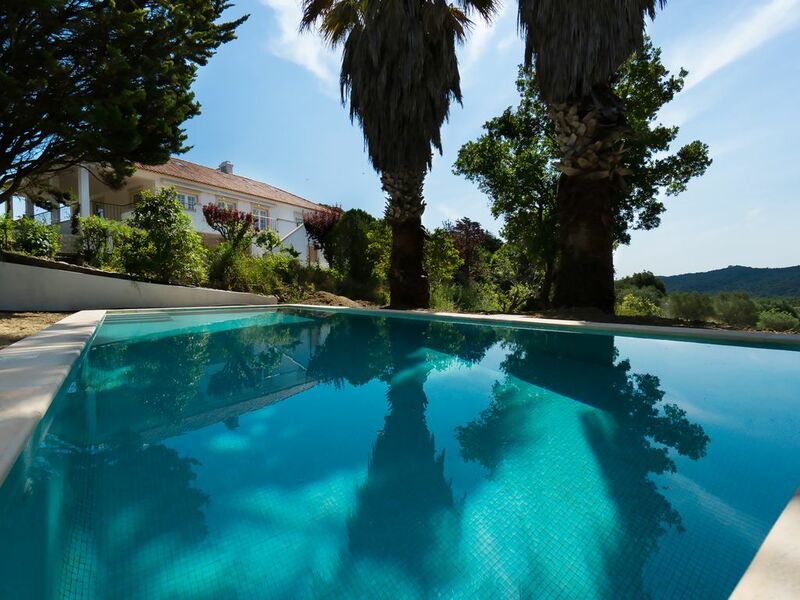 ), 9 Km from Arrábida Golf Resort and 20 Km from Aroeira Golf and Golf Montado. There is a Padle field in Vila Nogueira de Azeitão. There are tennis courts at 4 km in Brejos. Do yoy want to discover the Serra on a horseback ride? And make an unforgettable picnic? Do you want to walk on one of the many trails already outlined? Or would you prefer a quad bike ride or even a Jippe ride? Learn to do paragliding? Surf Stand Up Paddle? All this is possible and always within a few kilometers.